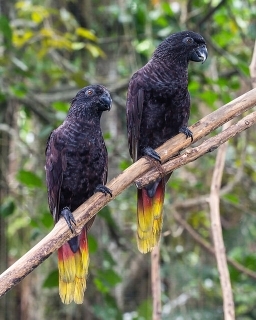 The Black Lory is the only all-black lory or lorikeet. C. a. atra: Both adults in general black; rump violet/blue; undertail olive/yellow washed with red, bare black eye-ring, black skin at base of bill. Eye orange/red. C. a. bernsteini: Red/purple markings on forehead and thighs, less evident in females; darker blue rump. C. a. insignis: Head streaked grey/blue; forehead, face, thighs and underwing covers red; feathers of throat and lower underparts edged red; dull blue rump, undertail covers grey/blue. C.a. atra: As in adult but with white cere and eye-ring. Eye grey. C. a. bernsteini: As in adults. C. a. insignis: Lores tinged red, forehead and face black, red less bright on thighs. Parrots of the World, Forshaw, 2006. Parrots in Aviculture, Low, 1992. Parrots: Their Care and Breeding, Low, 1986. A few in captivity (C.a. insignis). Aviary with well drained floor (sloping) or suspended cage over concrete base. Nectar made from baby cereal (no lactose) honey and malt extract or molasses, mixed with filtered water with the addition of wheat germ, made fresh once or twice daily, or a proprietary type (store bought) for small species; as well fresh fruit especially apple, orange, cactus fruits, and bananas and a few vegetables: corn, green leaves, hardcooked egg, carrot. Hanging nectar bottles or cups around aviary, providing browse with edible flowers, various chew and plastic toys (non-toxic); provide bowls of water for bathing. L-shaped, up to 9" (22.9cm) high, 9" (22.9cm) wide, 18" (46cm) long and 18" (46cm) deep; entrance hole 3" (7.6cm); also provide boxes for them to sleep in year round. C.a. atra: Western Vogelkop, Irian Jaya, Indonesia; and adjacent islands Batanta, Misool and Salawati, W Papuan Islands, Indonesia. C.a. bernsteini: Misool, W Papuan Islands. C.a. insignis: E Vogelkop, nearby Rumberpon Island, and Onin and Bomberai Peninsulas, Irian Jaya. Open habitats, coastal coconut plantations, forest margins and mangrove; up to 200m (656 ft). Frequents open habitats such as coastal coconut plantations, savanna, forest margins, and Eucalyptus groves; sometimes found in large flocks foraging in flowering trees. 2 rounded eggs, 30 mm (1.17 in). Males in condition April and December. Please log-in now to find more research, resources and tools. Gain exclusive access to 600+ pages of additional research, seminars and podcasts, specialists to ask your toughest questions, and dozens of other fun resources - when you become a WPT member.